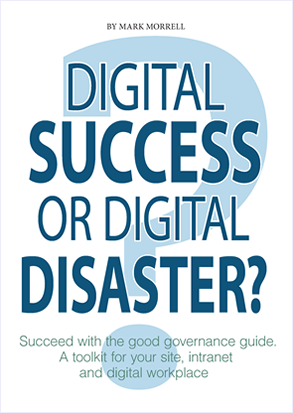 Governance doesn’t just cover intranets. It covers wider areas e.g. digital workplace and smaller focused areas e.g. web sites. Recently I helped to improve how a client managed their documents. There was little guidance to show the best way to use the existing file sharing systems. There was no clear connection between policies that affect how documents are managed and how they were being applied on a day-to-day basis. There were no examples showing how documents should be managed or help, contact points or places to share a problem or knowledge. Online discussion group, open to everyone to ask questions, share hints and tips, and help solve issues raised. Frequently Asked Questions: create FAQs to answer the same questions being asked regularly that give the definitive answer that people can refer to and save time. How to guides: Guidance in the form of ‘How to…’ guide that contain practical hints and tips on using the Document Management System. Support people needing face-to-face training on how to use the Document Management System with further online training that helps to reinforce the changes people need to make. Are you still buzzing from IBF 24 like me? I’m thinking about how to improve digital workplaces inspired by the great examples shown and discussed. I’m also thinking how digital workplace people are recognised more for the role we do. On this year’s IBF 24 I again discussed with Christy and Mark how we can improve career prospects for digital workplace people and continued this discussion on Twitter. My take on the discussions came down to three ideas. What are your thoughts on them? People become digital workplace professionals for a variety of reasons. Sometimes it is a planned career move, a natural progression maybe from communications or you just stumble into this role by accident. There is help out there: books by Martin White, Michael Sampson and James Robertson; training from Clearbox Consulting; wiki/book project I’m helping Kristian Norling and James Royal-Lawson with. But it isn’t easy to find out what learning exists or someone to help you unless your organisation belongs to the Intranet Benchmarking Forum, Step Two, IntraTeam or J Boye communities. It more easily available either online or provided by new or existing learning providers who understand the digital workplace. It to be consistent and transferable from one country to another. I am not aware of a professional qualification that covers the digital workplace. I know there are several discussions and plans for an academy or qualification but nothing exists yet. A recognised academic route to a professional qualification. Our individual knowledge and skills recognised in a collective way globally. The professional qualification to be accepted by businesses and seen to be of value by senior business executives. Small businesses seem to ‘get it’ better about the value digital workplace professionals contribute. I’m sure the frequency of direct contact with CEOs and Directors helps greatly to achieve this. For larger organisations it is more difficult to achieve that visibility. It is also hard sometimes to show what a digital workplace professional brings to an organisation. Important business qualifications to include the contribution of the digital workplace. The value digital workplace professionals add. Acceptance by senior executives of the need for digital workplace prefessionals and succession planning. So, is this the right approach? What are the next steps? Who can help?